I purchased Apple & Quince at my local Target store and I wish I had a scent description to post with this review but couldn’t find one. 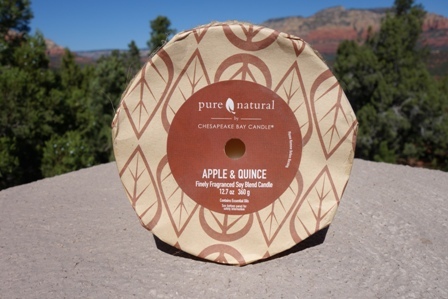 This candle smelled really fresh and not your typical apple scent. In fact, I didn’t even really smell apple so I’m guessing this scent is all quince. I did a quick internet search to see what quince smells like and the result was… it’s similar to a sweet guava. Yes!! That has to be what I’m smelling – guava. Whatever it was, it was very sweet and refreshing. Time to light this candle to see how it performs!! Even though this was a three wick candle, I still decided to stay conservative and light this candle in a small bathroom to start out – and that’s where it stayed till the very end. Once the wicks were lit, it took roughly ten minutes to reach a full melt pool and from then on out… the sweetest scent of quince and yes, even apple drifted through my bathroom. It smelled sugary and very soothing. I loved it. The only sad part, the aroma was pretty light but still perfect for a really small room. Had it been stronger, I would have been in heaven. The aroma really was lovely – a sweet and sugary guava type scent with subtle hints of apple. Very different and 100% soothing. I will for sure purchase this candle again next time I’m at Target. Strength – I would rate this candle a 6/7 out of 10 in a really small room. I wouldn’t attempt in anything larger. My opinion. This candle burned perfect well. All three wicks lit right up and stayed consistent throughout the whole life of this candle. Clean and even burn from start to finish. This was such a nice and soothing apple scent, not a term I use often to describe apple but this one was. It just smelled soft and soothing but still fruity at the same time. I’ll definitely be purchasing this scent again next time I’m at Target. Definitely check this scent out next time you’re in the mood for something different.